Bulgari Omnia Indian Garnet Fragrance 2014. 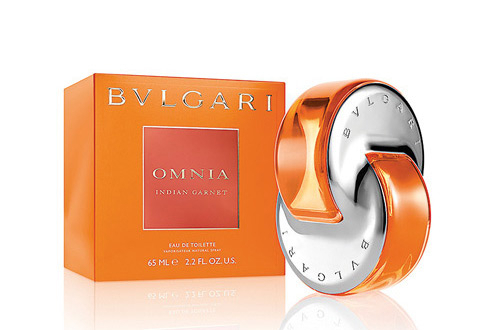 Bulgari Omnia Indian Garnet 2014 Fragrance. The new Bulgari Omnia Indian Garnet fragrance is scheduled to hit stores worldwide starting with April and is already available for pre-order on the luxury label's website. The Indian influences can definitely be sensed in the new scent's composition. The Omnia Indian Garnet fragrance created by Firmenich perfumer Alberto Morillas opens up with top notes of mandarin and saffron while a heart of Indian tuberose and osmanthus and base notes of Indian woods and amber complete the stunning new perfume. According to the Bulgari fragrance's creator, the ‘Capriccio a Portofino,’ necklace which features mandarin garnets carved in the shape of leaves was the item that served as inspiration. In the US the launch of the new scent is strategically planned in time for Mother's Day. The luxury label has chosen model Edita Vilkeviciute for its newest ad campaign, which was lensed by skilled photographer Mikael Jansson. The new ads capture the luxurious allure of the new scent in a very simple and classy manner. In the new commercial, the model wears an elegant gown keeping the new scent in her hand as a precious accessory. The Bulgari Omnia Indian Garnet perfume will come in three versions: as 25, 40 and 65 ml Eau de Toilette for prices ranging from 46 euros (about $63) to 75 euros (about $103). A bath line featuring beauty oil and a limited-edition 150 g. bar of scented soap will also be launched.